Madonna watercolor quilt kit designed by Emily Stutzman exclusively for Whims Watercolor Quilt Kits. No image permeates Christian art as much as the image of the Madonna and child. For over a thousand years, through Early Renaissance periods the Madonna was the most often produced pictorial artwork. Some of the images have achieved fame. Renowned painters such as Leonardo da Vinci, Michelangelo, and Raphael have offered their rendition of Madonna. 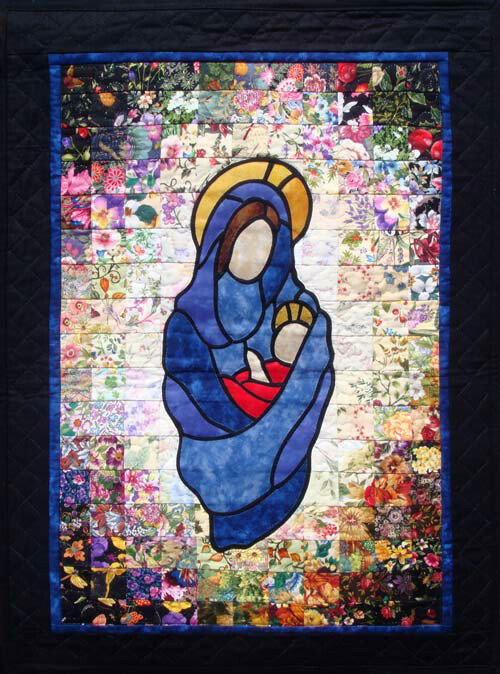 Piece your own Madonna into the fabric of Watercolor and enjoy a masterpiece for yourself or as a gift. Kit includes die-cut watercolor fabrics, necessary applique fabrics and patterns, along with detailed instructions and a color photo. Finished size is approximately 16.5 inches x 27 inches without border.